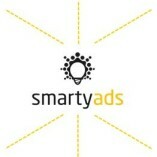 SmartyAds is an autonomous and open full-stack ad-tech platform that contains data, creativity, and trading, serving the global digital advertising ecosystem. Combining DMP, DSP, SSP and Ad Exchange we use Big Data and Machine Learning to meet... our customer's goals. SmartyAds presents one single platform for all your needs, that can deliver your mobile display, video and native campaigns, on a worldwide scale, to targeted audiences.